The telecom industry is in a funk. S&P recently said that their “global 2017 base-case forecast is for flat revenues” and other analysts are predicting little growth in traditional telecom’s top line over the coming years across most developed markets. This recent post shows that wireless revenue by the largest US firms has basically flatlined with growth of only 1% from 2015 to 2016. Cord cutting in favour of wireless has long been a feature of incumbent wireline firms but now wireless carrier’s lunch is increasingly being eaten by disruptive new players such as Facebook’s messenger, Apple’s FaceTime, Googles’ Hangouts, Skype, Tencent’s QQ or WeChat, and WhatsApp. These competitors are called over the top (OTT) providers and they use IP networks to provide communications (e.g. voice & SMS), content (e.g. video) and cloud-based (e.g. compute and storage) offerings. The telecom industry is walking a fine line between enabling these competitors whilst protecting their traditional businesses. 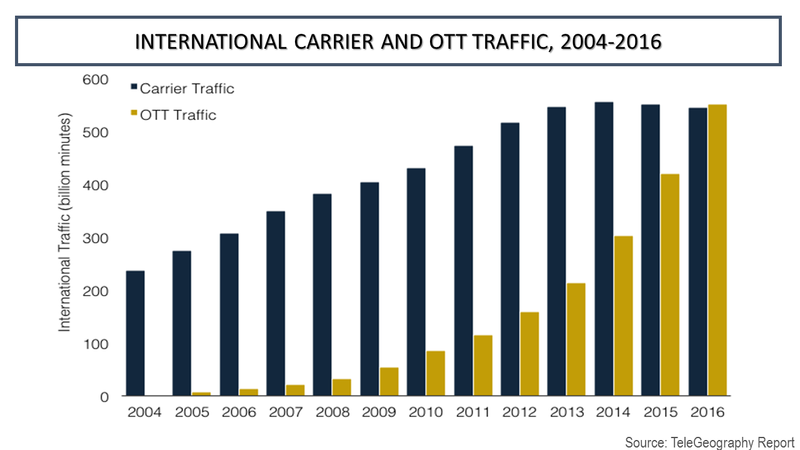 The graph below from a recent TeleGeography report provides an illustration of what has happened in the international long-distance business. 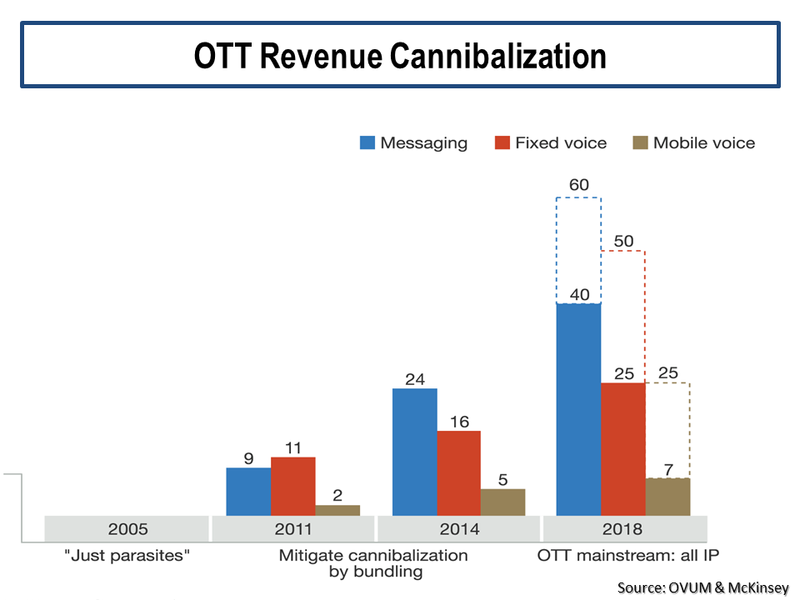 A recent McKinsey article predicts that in an aggressive scenario the share of messaging, fixed voice, and mobile voice revenue provided by OTT players could be within the ranges as per the graph below by 2018. Before the rapid rise of the OTT player, it was expected that telecoms could recover the loss of revenue from traditional services through increased data traffic over IP networks. Global IP traffic has exploded from 26 exabytes per annum in 2005 to 1.2 zettabytes in 2016 and is projected to grow, by the latest Cisco estimates here, at a CAGR of 24% to 2012. See this previous post on the ever-expanding metrics used for IP traffic (for reference, gigabyte/terabyte/petabyte/exabyte/zettabyte/yottabyte is a kilobyte to the power of 3, 4, 5, 6, 7 and 8 respectively). According to the 2017 OTT Video Services Study conducted by Level 3 Communications, viewership of OTT video services, including Netflix, Hulu and Amazon Prime, will overtake traditional broadcast TV within the next five years, impacting cable firms and traditional telecom’s TV services alike. With OTT players eating telecom’s lunch, Ovum estimate a drop in spending on traditional communication services by a third over the next ten years. Telecom and cable operators have long complained of unfair treatment given their investments in upgrading networks to handle the vast increase in data created by the very OTT players that are cannibalizing their revenue. For example, Netflix is estimated to consume as much as a third of total network bandwidth in the U.S. during peak times. Notwithstanding their growth, it’s important to see these OTT players as customers of the traditional telecoms as well as competitors and increasingly telecoms are coming to understand that they need to change and digitalise their business models to embrace new opportunities. 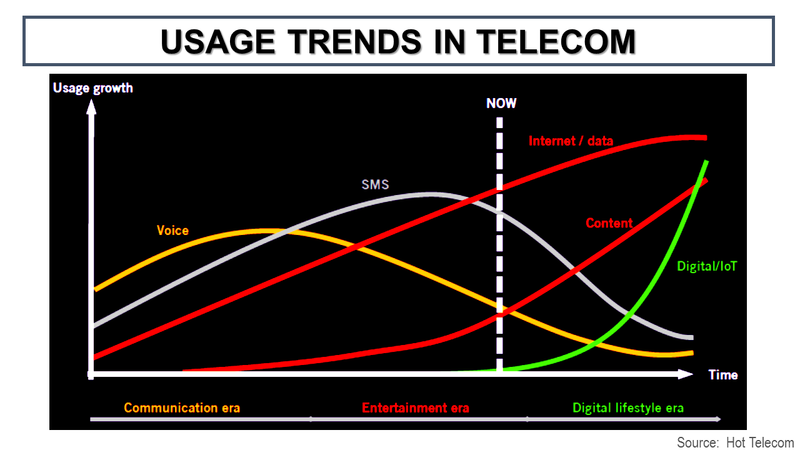 The graphic below, not to scale, on changing usage trends illustrates the changing demands for telecoms as we enter the so called “digital lifestyle era”. The hype around the internet of things (IoT) is getting deafening. Just last week, IDC predicted that “by 2021, global IoT spending is expected to total nearly $1.4 trillion as organizations continue to invest in the hardware, software, services, and connectivity that enable the IoT”. Bain & Co argue strongly in this article in February that telecoms, particularly those who have taken digital transformation seriously in their own operating models, are “uniquely qualiﬁed to facilitate the delivery of IoT solutions”. The reasons cited include their experience of delivering scale connectivity solutions, of managing extensive directories and the life cycles of millions of devices, and their strong position developing and managing analytics at the edge of the network across a range of industries and uses. Upgrading network to 5G is seen as being necessary to enable the IoT age and the hype around 5G has increased along with the IoT hype and the growth in the smartphone ecosystem. But 5G is in a development stage and technological standards need to be finalised. S&P commented that “we don’t expect large scale commercial 5G rollout until 2020”. So what can telecoms do in the interim about declining fundamentals? The answer is for telecoms to rationalise and digitalize their business. A recent McKinsey IT benchmarking study of 80 telecom companies worldwide found that top performers had removed redundant platforms, automated core processes, and consolidated overlapping capabilities. New technologies such as software-defined networks (SDN) and network-function virtualization (NFV) mean telecoms can radically reshape their operating models. Analytics can be used to determine smarter capital spending, machine learning can be used to increase efficiency and avoid overloads, back offices can be automated, and customer support can be digitalized. This McKinsey article claims that mobile operators could double their operating cashflow through digital transformation. However, not all telecoms are made the same and some do not have a culture that readily embraces transformation. McKinsey say that “experience shows that telcoms have historically only found success in transversal products (for example, security, IoT, and cloud services for regional small and medium-size segments)” and that in other areas, “telcoms have developed great ideas but have failed to successfully execute them”. 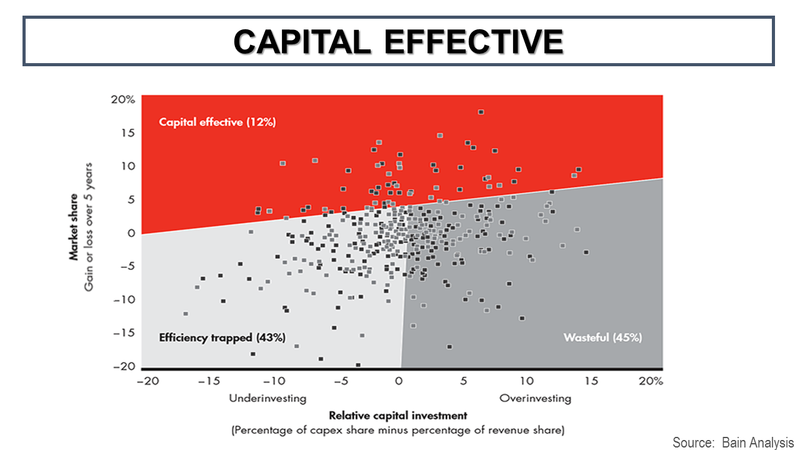 Another article from Bain & Co argues that only “one out of eight providers could be considered capital effective, meaning that they have gained at least 1 percentage point of market share each year over the past ﬁve years without having spent signiﬁcantly more than their fair share of capital to do so”. As can be seen below, the rest of the sector is either caught in an efﬁciency trap (e.g. spent less capital than competitors but not gaining market share) or are just wasteful wit their capex spend. So, although there are many challenges for this sector, there is also many opportunities. As with every enterprise in this digital age, it will be those firms who can execute at scale that will likely to be the big winners. Pure telecommunications companies could become extinct or so radically altered in focus and diversity of operations that telecoms as a term may be redundant. Content production could be mixed with delivery to make joint content communication giants. Or IT services such as security, cloud services, analytics, automation and machine learning could be combined with next generation intelligent networks. Who knows! One thing is for sure though, the successful firms will be the ones with management teams that can execute a clear strategy profitably in a fast changing competitive sector.